Irene Wangari heard of the opportunity, and seized it. 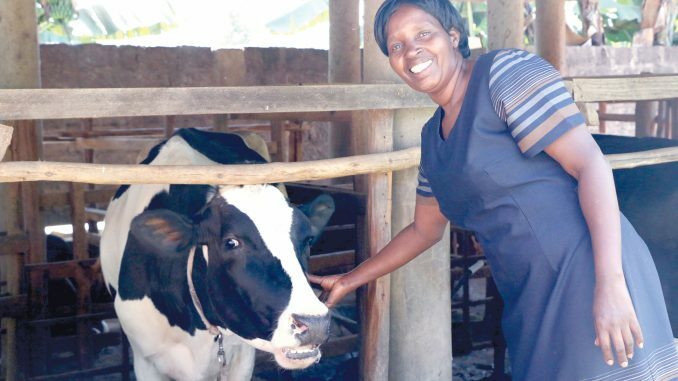 “Feeds Farm Shop, told us of Juhudi Kilimo, that we can get dairy cows, earn from them and pay for them from the milk they give us; what better news could they have delivered?” she recalls. Wangari whose husband had already retired and their children matured enough to fend for themselves, did not hesitate. This would be the a proper way to earn her upkeep, since she loves keeping livestock, especially cows. “I first bought one calf on loan and they have since bloomed to eight mature dairy cows,” she explains. Wangari gets fifty litres of milk a day which she sells to Kiambaa dairy cooperative and some to her neighbours. “Juhudi Kilimo has been very educative. In one of the training sessions they organized for us, I learnt a lot about how I can maximize the productivity of my cows,” she narrates. “For example I learnt how to make silage and the best way to feed the cows,” she adds. Wangari who belongs to Wakulima Bora self-help group, appreciates the group lending methodology that is practised by Juhudi Kilimo. “Through the self-help group, I learn so many things, for example where to get the feeds from, and advice about market and services required by the cattle for proper growth,” she says. To feed her cattle, Wangari mixes sieved chicken manure, maize bran and flour. She also owns a chaff-cutter with which she shreds dry grass. According to her, most of the costs in dairy farming goes to veterinary services and feeding. Apart from the dairy cattle, Wangari rears poultry. “When I realized that I needed chicken manure, I decided to rear chicken,” explains Wangari who begun with 150 chicken. She sells most of these chicken to butchers. “I plan to add 350 more broilers, through a loan I plan to take from Juhudi Kilimo,” she says. Her advice to poultry farmers is that if they can do business without having to involve intermediaries, then they can get satisfactory returns.